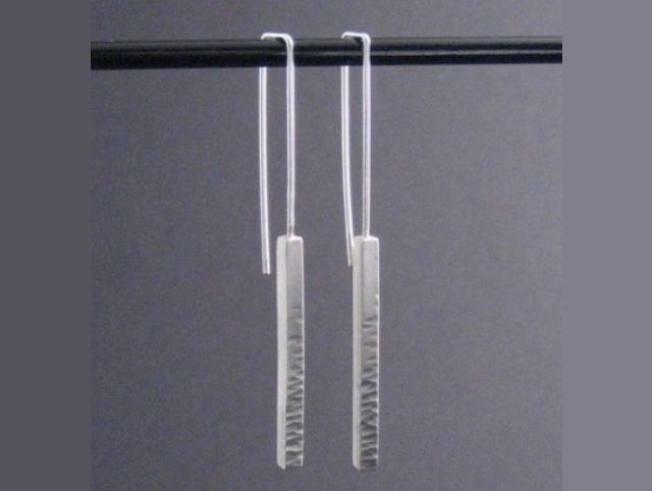 These earrings are made of hand-forged silver. Move over Love Potion No. 9, there’s a newcomer in town that’s well on its way to stealing our hearts. Elixir9 is a newly launched line of hand-forged silver and gold jewelry from San Francisco designer and metalsmith Elizabeth Lass, who recently made her retail debut at The Mission Statement. Split into two distinct groupings, Lass’s bright and shiny adornments range from the Argentum collection’s hand-hammered, geometric shapes made of recycled sterling silver wire to the Natrium collection’s silver necklaces and earrings hung with one-of-a-kind fossils, sharks teeth and semi-precious stones. “They both have their distinct personalities, but the common element between the two is the forging,” explains the Lower Haight resident, who has honed a signature striking technique that gives her work its highly textured, glimmering finish. Lass gets more out of her hard-hitting approach than pretty results. “I really enjoy hitting metal with a hammer. It’s really satisfying,” says Lass, a graduate of the Revere Academy of Jewelry Arts and the Women’s Initiative. A former graphic designer, Lass set out to turn her jewelry pastime into a full-time business last year just as the economy started to tank. Was she scared about the decision? Yes. Did that stop her? No way. “For me, there’s nothing more exhilarating than holding in my hands what was once just an idea in my head. Sometimes I can’t believe it took me this long to ‘find’ jewelry, as it’s this perfect blend of craft, design, science and fashion. It was staring me in the face for a while and I just wasn’t listening,” she says. But listen she did, and she’s not the only one taking notice. In July, Lass was selected as a Top 10 Copper Circle Finalist in a national artist grant competition for emerging designers sponsored by Halstead Bead Inc.
For more about Lass, visit her online via her web site, pop into her etsy shop or follow her on Twitter. Lorraine Sanders is the creator of SFIndieFashion.com.